Have a question for Nadia Pension? 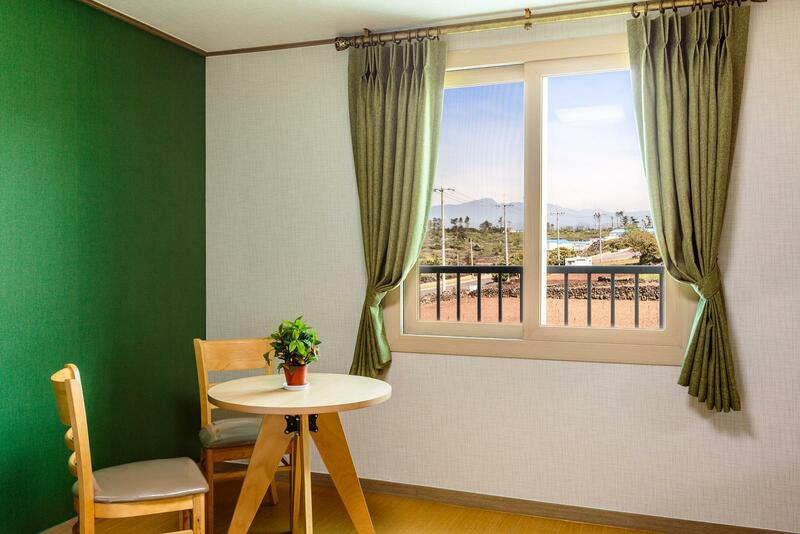 When visiting Jeju Island, you'll feel right at home at Nadia Pension, which offers quality accommodation and great service. Set from the excitement of the city, this 2-star hotel commands an excellent location and provides access to the city's biggest attractions. With its convenient location, the hotel offers easy access to the city's must-see destinations. Nadia Pension offers impeccable service and all the essential amenities to invigorate travelers. Free Wi-Fi in all rooms, kitchen, express check-in/check-out, luggage storage, Wi-Fi in public areas are just a few of the facilities that set Nadia Pension apart from other hotels in the city. Step into one of 10 inviting rooms and escape the stresses of the day with a wide range of amenities such as television LCD/plasma screen, internet access – wireless (complimentary), non smoking rooms, air conditioning, desk which can be found in some rooms. The hotel's recreational facilities, which include garden are designed for escape and relaxation. 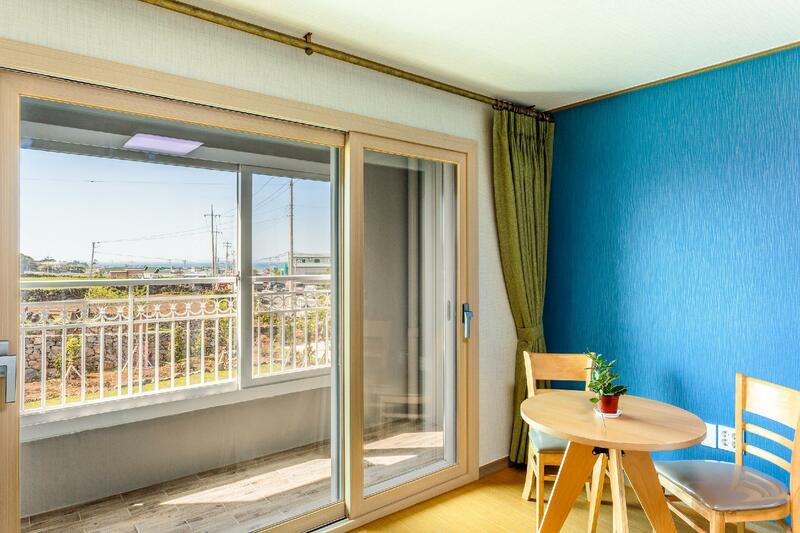 Nadia Pension is an ideal place of stay for travelers seeking charm, comfort and convenience in Jeju Island. 숙소 직원이라고는 사장한분밖에 없는듯. 사장 외출시 관리할 직원 없음. 하루 자는데 수건은 많이 줌 5장.. 뭐 두장말고는 쓸일이.. 그닥.. 앞에 하나로마트큰거하나 제외하고는 다 차를 이용해야함. 무슨 모텔같음. 조용한거 빼고는 딱히 좋다고 할만한게 없다. 거리가 다소 있고, 바다와도 차가 없다면 거리가 있습니다만, 차가 있으면 바로 앞 하나로마트에도 인접하고 여러가지 장점이 매우 많았습니다. 추천합니다. 방은 깨끗합니다. 가성비 괜찮은 편이지만 생수가 없고 근처에 편의점도 없어서 좀 아쉬웠어요. 물 미리 준비해야 되요. 한담해변까지 걸어서 왔다갔다하기 좋은 위치여서 정말 좋았습니다. 깨끗하고 따뜻하고 흠잡을것이 하나도 없네요~ 아! 짐 들고 계단으로 올라가는게 좀 힘들었네요. 일단 별로 였어요 일단 2층으로 밖에 안되어 있어서 계단밖에 없어 짐이 많은 분들은 계단을 오르기가 힘들 수 있습니다. 그리고 위치가 너무 별로에요. 주변에 정말 아무것도 없습니다. 차를 이용하지 않는다면 정말 다니기 힘든 위치니 뚜벅이 여행이라면 정말 비추에요. 냉장고에 물 한병이 없고, 콘센트가 많이 없어요. 벽에서 찾고 찾다고 냉장고를 연결해두는 콘센트에 하나 남는데가 있어서 거기다가 폰충전 했습니다. 한곳 밖에 없고 화장실에 하나 있어요, 그렇게 두개. 뭐 이정도 부분은 그만큼 숙박비가 싸기 때문에 어느정도 감안할 만합니다. 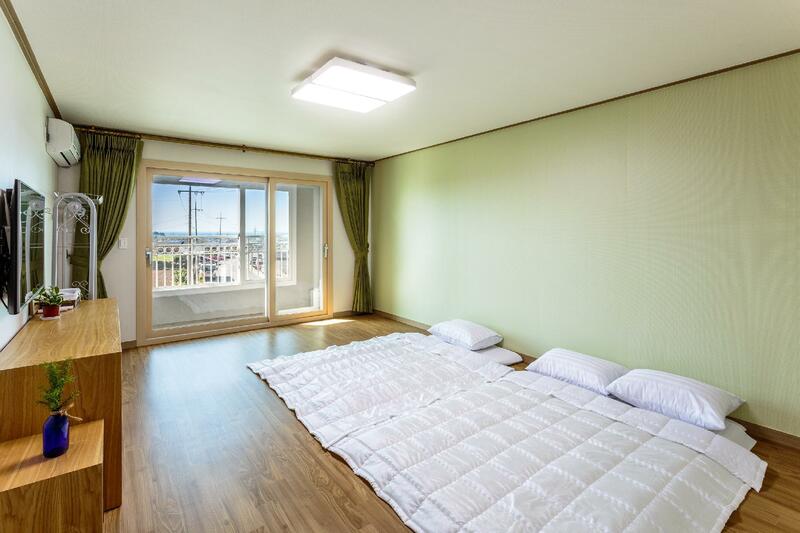 사실 가장 마음에 안들었던 부분은.. 처음 207호를 사용하게 되었는데 창문열자마다 웬 무덤이.. 정말 바로 앞에 있어요. 무시할 수 없는 위치에요. 바다뷰 마운틴뷰 시티뷰는 들어봤어도 무덤뷰는 처음이었습니다ㅋㅋ 그래서 혼자자기 찝찝하고 돈 주고 무덤옆에서 자러 왔나 싶어서 방을 바꿔달라고 요청했습니다. 같은 방 등급은 남은게 없다면서 만원을 더 받고 바다뷰라면서 내어준 방은 그냥 바다를 향해 있는 방이었다는 게 맞아요. 바다 1도 안보였어요. 또 방을 바꾸러 가니까 숙소를 어디서 예약했는지 뭐 이것저것 확인하면서 그닥 탐탁지 않아 하시는 모습이었습니다. 좋았던 점은 난방은 따뜻하게 잘되었고, 수압도 좋고 청결 했습니다. 참고로 샤워수건은 따로 구비되어 있지 않았습니다. 무튼 위치나 전반적인 것을 따져서 저는 재이용 안 할 것 같아요.